Qbrick System was created in response to the needs of professionals who value innovation and understand multi-tasking. We’ll show you how to get the most out of all the elements of the system. We will check how Qbrick System works in the extreme operating conditions and not only. Thanks to Extrempro you can watch the presentation of Qbrick System through the eyes of a professional! Test shows excellent impact resistance of the covers of organizers used in Qbrick System One. Covers are made of transparent polycarbonate, which ensures excellent impact resistance and full visibility of the content of the organizer. Qbrick System ONE is also very helpful work platform. With this feature, you’ll increase your reach up to 2.70 m.
Test shows excellent durability of latched used in Qbrick System ONE products. Latches are made of technical polyamide that guarantees excellent durability without the risk of corrosion. The test shows the resistance of the tool boxes Qbrick System One on water and dust. Thanks to the flexible seal and hermetic design our solutions guarantee a high level of security for your valuable tools. 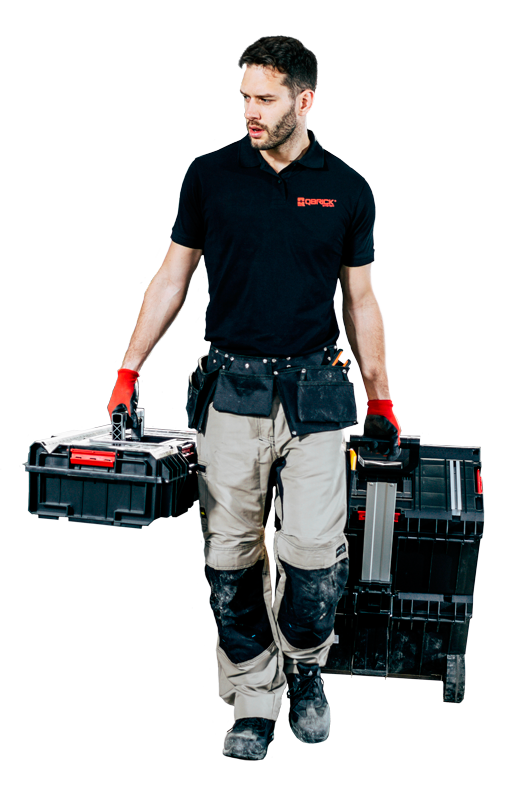 The test shows the excellent resistance of new tool boxes Qbrick System One on potential damage.